Monte Carlo Simulation with a Decision Tree. Say you have an investment portfolio where the best case scenario, you may profit 100$ and in the worst case scenario, you may lose 50$. So, it is easy to create a risk profile for this investment, as there can be just 2 possible states. Now, what if the Investment 1 best case profit is not fixed 100$, rather it can vary from a range of values like 0$ to 150$ with a probability distribution (i.e. Normal Distribution with mean = 75$). In order to make things complicated, say, the best case loss of Investment is also not fixed. Rather it can vary from 0$ to 100$ with a uniform probability distribution. Then, what are the possible set of scenario for investment? It can be many combinations that you cannot even count. For example, it can be a combination of Profit = 11$ and Loss = 20$. It can be another combination of a profit = 12$ and loss = 19$. And so on. How can we create a risk profile for this investment? As the probability distributions are continuous, theoretically there can be an infinite number of combinations which we cannot manage to analyze. So, what is the solution? The solution is that we can take a random sample for Profit according to the probability distribution of the Profit (which is Normal Distribution in our case) and we can take a random sample for the cost according to the probability distribution of the cost (which is a uniform probability distribution in our case). Then we can calculate the total Payoff (or utility) for the node based on regular Multi-Criteria Decision Analysis logic and consider it as a sample combination. We can take the sample for a huge number of times (i.e. 10,000 times) and then we can group the sampled outcome by a range of values and create a risk profile for those range of values. That is the idea of a Monte Carlo Simulation. 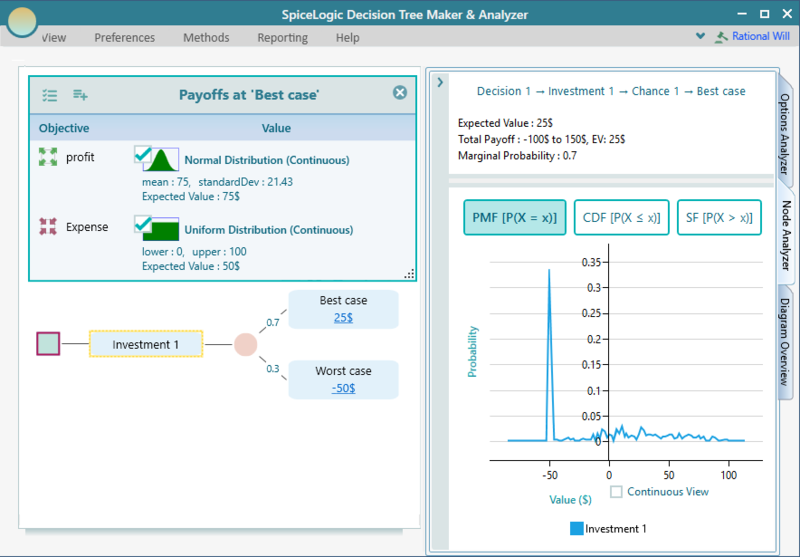 The Decision Tree Software will execute Monte Carlo Simulation whenever there is a probability distribution used. The risk profile chart will be calculated based on the Monte Carlo simulation. You will see the same Risk profile chart in the Options Analyzer section for the overall Decision context. By default, the Monte Carlo Simulation option is turned on for any scenario when a Probability Distribution is used. You can turn off that behavior completely by setting the drop down box selection to "Not Instantly" as you can see in the above screenshot. If you set to "Not Instantly", then, you will see a button to Execute the Monte Carlo Simulation so that you can manually execute the Monte Carlo Simulation whenever you wish. If you set the option to "Always Instantly", then no matter if Probability Distribution is used or not, if there is at least a chance node in a decision tree, Monte Carlo simulation will be used to generate the Risk Profile. Finally, you may want to set the number of sampling for the Monte Carlo Simulation. You can control that directly from the box as shown below.